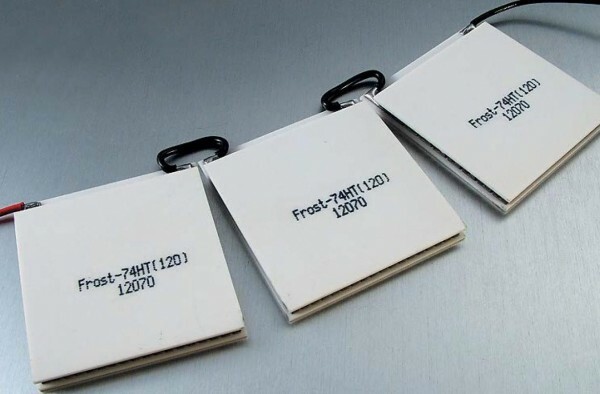 Product information "Thermoelectric Peltier Modules for Industrial Applications"
Kryotherm produces a wide range of single-stage thermoelectric coolers (TECs) that can be used for industrial applications. These TECs are able to solve most of the tasks of industrial cooling and thermo-stabilizing and are subdivided by design to high efficient, standard, one or two sections, round, square or rectangular shape ones, with or without a hole. Kryotherm’s thermoelectric coolers for industrial applications provide high efficiency, reliability, and performance accuracy. Operation at temperature cycling conditions often requires rapid periodical changes of the temperatures of one or both sides of a TEC in a wide (several tens of degrees) range and a lifetime up to 500,000 cycles. Our thermoelectric coolers for industrial applications produced by Kryotherm meet all the modern industrial standards and special requirements. The quality and reliability of TECs are verified by numerous tests performed according to Kryotherm’s advanced Quality Management System. Related links to "Thermoelectric Peltier Modules for Industrial Applications"
Customer evaluation for "Thermoelectric Peltier Modules for Industrial Applications"